How would you feel if you were 12 inches tall and suddenly your home was filled with blithely stepping feet or hordes of small children who run around screeching, trying to “play” with you? Or maybe after your people spend hours cooking something that smells like it should be for you, they take that food and leave you alone for hours, only to come back reeking of even more delightful morsels — and worse yet, other animals! If nothing else, you’d be stressed out because the routine you so cherish went out the window. 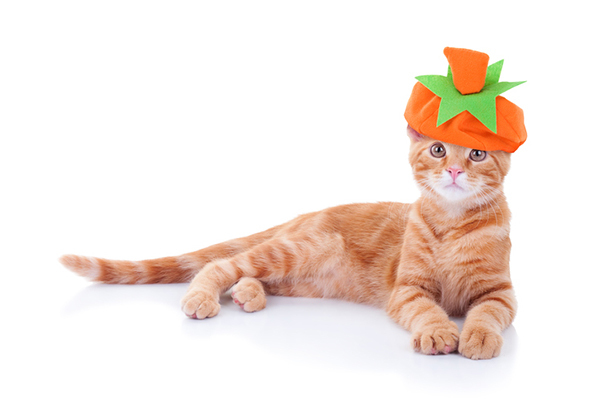 Thanksgiving and the fall and winter holidays can be a matter of cat health and safety. 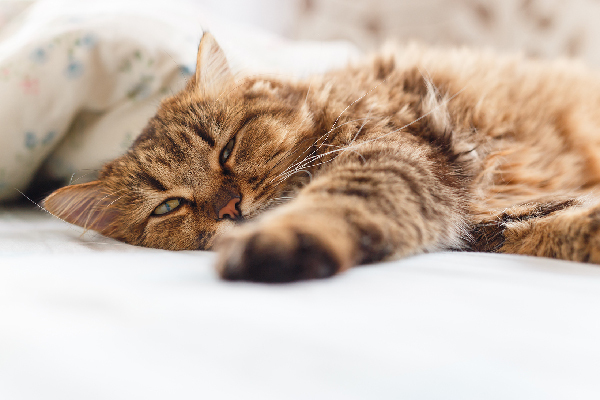 So what can you do to help your cat cope with Thanksgiving stress? Read on and find out. 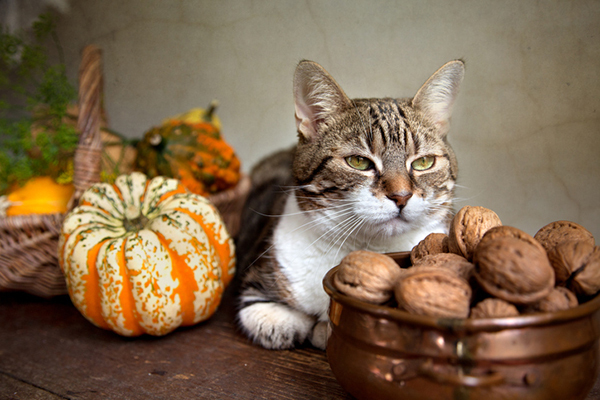 Can cats eat Thanksgiving foods like pumpkins? Find out more from this article. Photography ©Stephanie_Zieber | Thinkstock. I don’t often recommend feeding your cat “people food,” but once in a while — like on special days such as Thanksgiving — it can’t hurt. 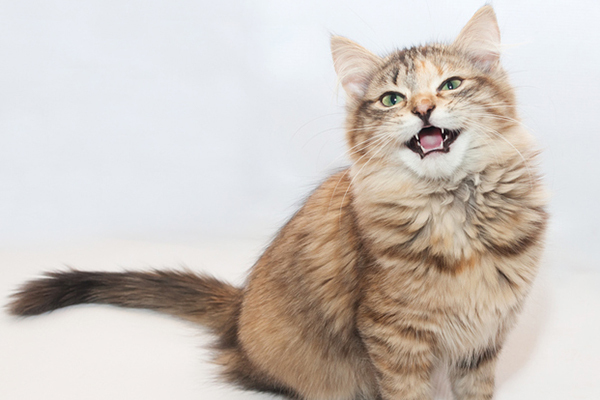 If you bring home some extra plain turkey, make a point of sharing a little bit with your cat. The quickest way to a cat’s heart is through her stomach, after all. Say what you will about flower essences, but Bach Rescue Remedy is a great thing to have around — not just for your cat, but for you, too. It’s a combination of flower essences designed to help relieve physical, emotional or spiritual trauma. The original tincture is preserved in alcohol, but Rescue Remedy Pet is an alcohol-free version (which is also a bonus for people who don’t want to ingest alcohol). I’ve found the most effective way to administer Rescue Remedy to cats is to put two drops on the end of my finger and then stroke it into the fur on top of the head. Rescue Remedy is available online and at most health food stores. It’s really important to take some time to be with your cat after a stressful event like a trip or a holiday gathering. 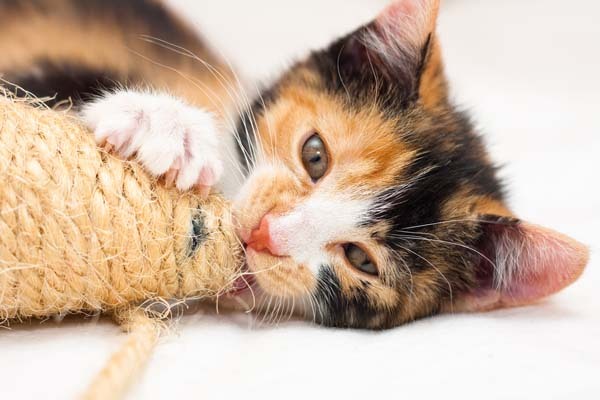 Your kitty will appreciate your willingness to hang out quietly with her and reassure her that everything’s back to normal. It’ll probably destress you, too, if you’re all wound up from the family drama that plays out at many Thanksgiving tables. 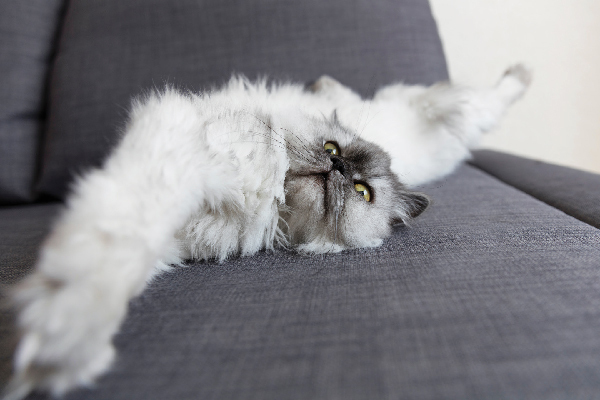 What have you done to help your cats cope with Thanksgiving stress and the holiday season in general? Please share your tips in the comments! Thumbnail: Photography ©nailiaschwarz | Thinkstock.